Did you know that having excess abdominal fat and a large waist circumference puts your health at risk? The unfortunate fact is that, today, a large portion of our population deals with overweight and obesity issues - having too much abdominal fat and having a high waist to hip ratio - all of which is not only unsightly, increases self consciousness about their bodies, and most importantly, severely increases their risk for various health risks such as cardio vascular diseases, heart failures, and in some cases, even increased mortality. More alarming is the large percentage of our children that are also more overweight and out of shape than ever! Over 17% of children are overweight, and 9% are obese - 15% of boys and 28% of girls have waist circumferences that puts them at increased risk of various health problems. As for adults, over one third of all adults are either overweight or obese. We certainly do not set a good example for our children when it comes to physical fitness and health. While most people understand the need to lose their abdominal fat to improve their health and look better, they do not realize that the excess abdominal fat in particular is a dangerous factor for poor health. So that while losing abdominal fat will help you look and feel better, more importantly, it will lower your health risks. Within the abdominal area, there are mainly two types of fat - subcutaneous fat and visceral fat. Subcutaneous fat is the fat that lies directly under the skin and on top of the abdominal muscles, and visceral fat is the internal fat that lies inside your abdomen surrounding your organs. Having excess visceral fat is known as central obesity and gives the "beer belly" look where the abdomen protrudes excessively. 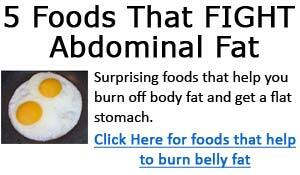 It is clear that having excess abdominal fat increases your health risks. We all value good health and want to be healthy, and if you are overweight or obese, then reducing your body fat and lowering your abdominal fat should be one of your priorities in achieving better health. With all that being said above, how do you go about losing your abdominal fat? What can you do to lower your abdominal fat, reduce your waist size, and reduce your health risks associated with having high abdominal fat? The first and most critical thing to understand is that there is no magical solution or pill that will make your problems go away - it took years for the excess body fat and abdominal fat to build up, and it will take some time and dedication to get rid of it. Doing ab crunches all day will not make your ab fat melt away; using gimmicks such as ab belts or rollers will not help you get rid of abdominal fat. The only solution is to do it the right way. To lose your abdominal fat and keep it off for good, you need to combine a balanced nutrition with properly designed workouts that will help you get fit, lose fat, and lose abdominal fat. You need to include a weight training component to your workouts along with intense, interval based cardio training sessions. While the ideas laid out here may sound pretty simple and straight forward, in practice, it's not quite so easy. You need to have a good diet and nutrition plan put in place that will help you create a calorie deficit; you need to design an effective workout program to stimulate muscle growth and burn fat, and no, doing ab crunches all day long isn't the way to go about it. You need to have the determination and perseverance to go through with your plan, to be able to maintain your diet, stick to your workouts, and push through your intense cardio sessions. Mike Geary is the "Abs Guru" that has the entire solution to getting rid of abdominal fat. All of the nutritional strategies, as well as training sequences, exercise combinations, and more have all been compiled in his Truth About Six Pack Abs Program. While his program effectively helps you get rid of abdominal fat, very small portion of the program is actually about abdominal exercises. The main point of this program is showing you the absolute most effective strategies for losing your stubborn abdominal fat, so you can get rid of that dangerous health risk, as well as get a flatter more defined midsection. Following the guidelines set out in the Truth About Six Pack Abs, you WILL lose your abdominal fat that has been plaguing you for years. This is not guesswork... it is a proven system that works time and time again for all of his clients on every corner of the globe that actually apply these strategies. If you apply it, the results will come. It's really that simple. 2. Circ Heart Fail. 2009 May;2(3):202-8. Epub 2009 Apr 7. Adiposity and incidence of heart failure hospitalization and mortality: a population-based prospective study. Levitan EB, Yang AZ, Wolk A, Mittleman MA. 3. Am J Kidney Dis. 2008 Jul;52(1):49-57. Epub 2008 Jun 2. Waist-to-hip ratio and body mass index as risk factors for cardiovascular events in CKD. Elsayed EF, Tighiouart H, Weiner DE, Griffith J, Salem D, Levey AS, Sarnak MJ.